Event organizers can pre-pay for event parking. Contact the on-site parking manager at 208-336-0821 or email AdaCoManager@carparkusa.com. Monthly parking permits for the IWC garage are available through the on-site parking office, The Car Park. Call 208-336-0821 for more information. Please note: Parking is not available in the surrounding businesses’ parking lots. Full-time students, faculty and staff are eligible for free bus passes through Valley Ride. Contact University of Idaho Boise Operations staff at uibops@uidaho.edu. Boise GreenBike bikes are available for rent by the Idaho Water Center and the Idaho Law Learning Center. U of I students receive a discount. For more mass transit options, see Valley Regional Transit. 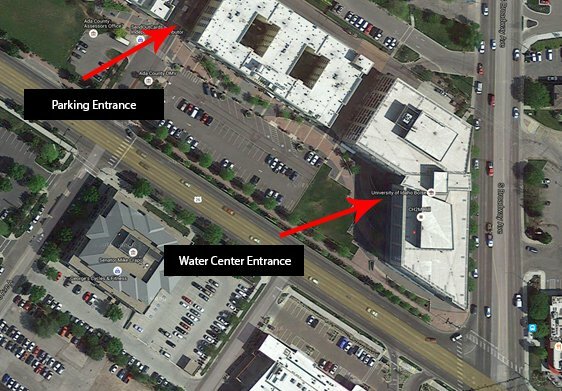 Parking and main entrance at the Idaho Water Center.